The Buffalo Bandits figured they needed a change of course as they prepared for the 2013 season. They were coming off a disappointing 7-9 season in 2012, a rare losing campaign that featured a first-round playoff loss. It was the latest step backwards for a team that had taken a slow decline since winning a championship in 2008. Bandits' management announced that Darris Kilgour would give up his duties as the team's general manager, and thus stick to the coaching job. Therefore, any new boss would oversee the old boss as a precondition of employment. That's an unusual arrangement in pro sports, although indoor lacrosse isn't typical in terms of such dynamics. Still, the position was attractive, The Bandits were one of the league leaders in attendance, and thus had resources that other teams didn't. The team also announced that assistant general manager Derek Graham had been relieved of his duties. The "help wanted" sign certainly caught the attention of Steve Dietrich, a former Bandits' goaltender who had worked as an assistant coach in Toronto. Dietrich had worked in management for Kitchener-Waterloo of Major Series Lacrosse in Ontario. Dietrich decided to apply the job, but be completely honest about what he planned to do with the team if he took control. The Bandits had been mortgaging their future in the form of trading draft picks for veterans for years. Considering how the draft was sending the league a stream of bigger, stronger athletes, that had to stop. "I knew the talent on the team well. I knew the age on the team," Dietrich said later. "... I thought, if I'm going to do this, I will say that this is how I feel." Perhaps to Dietrich's surprise, he discovered that Bandits' upper management had the same thoughts that he did. Dietrich was hired on July 19, 2012. It didn't take long for Dietrich to make an impact. He had one large asset to use, as the Bandits owned the third overall pick in the fall draft as a result of the Chris Corbeil trade. Dietrich dealt that pick to Minnesota, which was collecting top draft choices. In return, Buffalo acquired Shawn Williams, who had been with the team more than a decade before this, Brendan Doran, a first-round pick (fifth overall), and two second-round picks. That was quite a haul for moving back two spots in the first round. On July 31, Mike Thompson announced his retirement. He would always be remembered in Buffalo as the winning goalie in the 2008 championship game, and could brighten a locker room merely by stepping inside of it. While the news was a surprise, it was easy to wonder if the Bandits had some advance warning of it based on the midseason deal for Anthony Cosmo in 2012. Two more trades came in early August. Buffalo added some depth by picking up Glen Bryan and Jamie Rooney from Toronto for a second-round pick. Later the Bandits sent Kevin Buchanan and a third-rounder to Philadelphia for Mike Hominuck and David Brock. Veteran Chris White surprised practically everyone by leaving as a free agent for Toronto. The captain said in interviews that he wanted to be closer to home. Kilgour described the defenseman's departure as "a huge loss for us. "White was in a sense later replaced by Derek Suddons, formerly of Edmonton. The draft brought more new faces. The biggest was Dhane Smith, considered one of the top young players in Canada. If they needed a full scouting report on him, they only needed to ask Dhane's cousin - veteran Bandits' defenseman Billy Dee Smith. Buffalo used its second-round picks on Carter Bender, Hayden Smith and Jordan Critch. By that time, the Bandits clearly had enough players to stock a team and a half, so they started cleaning out the roster even before training camp began. Ian Llord, Roger Vyse and Tom Montour were released. Jeremy Thompson was sent to Edmonton for Aaron Wilson and a second-round draft pick. More cuts came in December, as Brandon Francis, Travis Irving and Angus Goodleaf - beaten out of the backup goalie job by newcomer Kurtis Wagar - were dropped. Meanwhile, Derek Hopcroft came in from Colorado for a conditional fifth-round pick. "I still think we have a championship-caliber team," Kilgour said on the eve of the season. "There are only nine teams in the league, so there's enough talent out there. We have to put things in place." Some familiar faces were still around - John Tavares (the new captain), Luke Wiles, Mark Steenhuis, Billy Dee Smith, Jay Thorimbert, Jon Harasym, Scott Self, Chad Culp, etc. Even so, when the proverbial dust had settled, half of the 2012 team was gone for the start of the 2013 season. Therefore, the new edition of the team had something of an air of mystery when it took the field for the first time on Jan. 11 in Philadelphia. By the second quarter, we had a hint of Buffalo's biggest problem in the new season. The Wings scored five straight goals in the first half to take a 7-2 lead, and coasted to a 13-8 win. Buchanan, who for some reason hadn't been a good fit in his one year as a Bandit, had three goals and three assists. The highlight of the game for Buffalo was a goal by Tavares, who scored on the hidden ball trick. A night later, the Bandits didn't look much better against Minnesota. The Swarm scored the first three goals of the game and had a 10-7 lead early in the fourth quarter. But Buffalo rallied to win, 13-12. Culp had the tying goal with 4:34 left, and Dhane Smith followed with the winner 23 seconds later. "I sort of closed my eyes and shot it. It went in," Smith said. 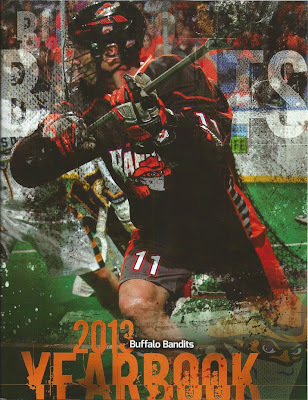 A week later, the Bandits played the most exciting game of the season in Rochester. The teams kept trading goals and leads throughout most of the games. Culp had another clutch score with 2:55 to tie it, and Buffalo had the ball in the final minute. Tracey Kelusky picked up a loose ball in the slot as the shot clock was winding down. With little time to do anything but shoot, he threw a behind-the-back shot on Rochester's Matt Vinc. The goalie missed it, and Kelusky had a game-winner with 11.8 seconds left. "It was a lucky goal. But we were not going to be denied tonight," Kelusky said. "It's pretty exciting to score a goal like that, but only because it helps the team." The thrills kept coming on Jan. 26 against Philadelphia. It was another back-and-forth game. The Wings' Drew Westervelt scored a short-handed goal with 43 seconds left to tie the game at 13-13. But Buffalo was still on the power play, and Wiles got the goal back with 23.6 seconds to win it. The Bandits found themselves at 3-1. "This is a little hard on the heart, but I like being on this side of the outcome," said Williams after the game, his 200th consecutive contest in the NLL to add to his league record. Toronto's Colin Doyle almost personally brought the Bandits back down to earth, scoring eight points on Feb. 2 in a 14-12 win in Buffalo. Two major penalties were particularly damaging to the Bandits' hopes, as the Rock scored four power-play goals. Seven days later, the Knighthawks came to Buffalo and returned the favor by spanking the Bandits, 15-7. It wasn't the worst home performance in history - a 22-11 loss to the Knighthawks in 2002 was still the champ - but it was close enough. Rochester had a 9-2 lead early in the third quarter to take away any suspense. Yet Buffalo bounced back on Feb. 16 with a 10-6 win back in Rochester. Cosmo made 54 saves and Wiles had three goals. After a week off, Buffalo went to Toronto and played a topsy-turvy game with the Rock. After an even first half, Toronto scored five straight goals to take a 10-7 lead late in the third quarter. But it was Buffalo that went on the run in the fourth quarter to score five straight goals and win, 15-13. Thorimbert was outstanding, winning 25 of 31 faceoffs, grabbing 17 loose balls and scoring two goals. Tavares said about Thorimbert, "That's probably the best game I've ever seen him play." The Bandits had finished the first half 5-3 and were right in the middle of the race for first place in the East Division. It was right back to work the next night, March 1, as Philadelphia returned to play in the First Niagara Center. The Bandits played an excellent first half, holding the Wings to two goals, and had a three-goal lead early in the fourth quarter. Philadelphia cut the lead to 10-9 with 4:40 left, and the Bandits' David Brock picked up a holding call with 2:09 left to add to the nervousness. However, Buffalo got through the Wings' power play with nine seconds left, and Brock raced into the defensive zone to help out. A tie for first place was only a few ticks of the clock away. What could happen in such a short time? A goal, that's what - a goal that turned the Bandits' season completely around for the worse. Jordan Hall scored with 3.7 seconds left to send it to overtime. Drew Westervelt tallied the game-winner for Philadelphia at 2:14 of OT, and the Wings were 11-10 winners. "Three seconds - it's so frustrating to lose those sorts of games," Wiles said. Next up was Colorado, only the second West team on the schedule. The Bandits stayed with the Mammoth for three periods, and then fell apart in the fourth. Colorado scored six straight goals to win going away, 12-6. "We had no energy, no desire, no will to compete," Kilgour said. The two teams were scheduled to play again in Colorado on March 16, but not all of the players turned up for the rematch. The NLL trading deadline was between the games, and the Bandits completed some moves. Self was shipped to Rochester for Alex Kedoh Hill, a promising young forward who was on the Knighthawks' practice squad. Jimmy Purves also went to Rochester for a draft choice. The deals were made with the future in mind, but they didn't figure to offer much immediate help to a team that had looked shaky at times. "I had a feeling there would be a shake-up, based on what was said after practice Tuesday night," Self said after receiving word of the trade. "So it didn't catch me completely by surprise." Wiles, who couldn't find his scoring touch for most of the season to that point, was placed on the practice squad. It was a stunning comedown for the forward, who was second on the team in scoring in 2012. He had missed part of training camp with a contract dispute and then had visa problems for a while which limited his practice time. The most memorable transaction of the week, though, was when Dietrich - needing a goaltender in case of an absolutely dire emergency - acquired his own rights from Toronto for a low 2015 draft choice. One can only imagine how that negotiation went. The slightly new cast had more fourth-quarter troubles in Denver on March 16. The Mammoth broke open the game with four straight goals, held off a Buffalo rally, and won by a 16-13 count. Then on March 23, Edmonton came in to Buffalo and showed what the future of indoor lacrosse looked like. The Rush was big, strong and fast. On offense, Edmonton went wherever it wanted, and on defense the Rush pushed Buffalo out of the way with ease. Edmonton had a 6-2 lead after the first period, with a 22-9 edge in shots to go with it. That was the game, a 14-7 rout. "I'm glad we have five wins, because I don't know when we're going to get another one," Kilgour said. Oddly, several Bandits players mentioned during the course of the losing streak that they noticed that the team had lost its confidence. When Buffalo gave up a goal, its players almost expected another one or two or three to follow. It's extremely unusual for pro athletes to talk this way. "We had them and we let it slip away," Williams said later. "We never could put a finger on what happened after that." March ended on another low in the form of a trip to Toronto. The two teams were separated by a single goal at the half, and then the Rock outscored the Bandits, 7-0, in the third quarter to go up, 14-6. Buffalo looked as if it expected things to go badly for long stretches. The 18-11 loss completed the first 0-5 month in Bandits' history. "Just before you go to bed, you go over the things that you do and what you did wrong," Steenhuis said. "It makes for a real crappy week, let me tell you." The Bandits had fallen to 5-9 and were staring at elimination from the National Lacrosse League playoffs. They played in Washington on April 13, and before long they heard the news that they needed to win the game in order to avoid the embarrassment of being the one team in the nine-team league to miss the postseason. Impressively, they did it. Buffalo scored eight goals in the fourth quarter to win, 15-10, ending the six-game losing streak. Wilson had four goals, and Williams had five points. There was one game left on the regular-season, at home against Rochester. Amazingly, the Bandits only needed to win that game in order to reach the playoffs. If other games broke correctly, Buffalo could even host a first-round postseason game by virtue of the tiebreaking formula. After the second half it had endured, Buffalo couldn't have asked for a better opportunity. It was only the third time in team history that the Bandits' playoff hopes came down to the final game. What's more, Rochester needed to win the game as well to be sure of making the playoffs. Adding to the drama was the status of Tavares, the team's veteran star who was finishing his 22nd year in the league. Tavares had been bothered by injuries throughout the season. He had torn a calf muscle against Washington, but decided to try to play if only to add a boost to the power play. The Bandits jumped out to a 4-1 lead, with Dhane Smith scoring two goals. But an old problem of Buffalo's this season - long runs by opponents - popped up again as the Knighthawks scored six straight goals. Rochester held on to the lead in a game in which both teams seemed nervous and ineffective on offense. Buffalo's last chance came after Mark Steenhuis had cut the Knighthawks' edge to 10-9 with 15 seconds left. The Bandits won the faceoff and set up a play. But Rochester's defense broke up the attempt, and Buffalo's 6-10 season ended with a whimper. Wagar added a postscript to the season when he was asked after the game about missing the playoffs. He said that if the team could have held on for a few more seconds against Philadelphia, "we wouldn't be having this conversation." Williams led the team with 65 points, followed by Wilson and Dhane Smith, whose 24 goals was first for Buffalo. Tavares and Steenhuis had 39 points each, and Wiles was down to 21 points. Cosmo finished behind Wagar in goals-against average, and that's in spite of the fact that Wagar gave up 18 goals in less than a game against Minnesota. Thorimbert had a team-record 180 loose balls and won more than 60 percent of the faceoffs. Steve Priolo's play picked up and he finished third in voting for NLL defender of the year, although he still was learning to pick his spots when it came to penalties. Kelusky played in only seven games during the season, and he finished with 10 points. His time as a Bandit was over. In April 2015, Kelusky revealed that he had been suffering from symptoms of Post-Concussion Syndrome during his entire career as a Bandit. That certainly offered a partial clue as to why his production dropped so quickly when he came to Buffalo for three seasons. The team statistics were downright disheartening to any Bandits fan. The team set a franchise record for losses in a season with 10. The Bandits had a losing record for a second consecutive year, which had never happened before. Kilgour missed the playoffs for the first time as a coach in Buffalo, and the team missed the postseason for only the fourth time ever. The Bandits finished 1-7 in the second half, their worst such record ever, and 2-6 at home, their worst such record ever. The squad used a total of 31 players, the most since the 1999 team used 31. The power play was the league's worst. Here's the catch: The Bandits finished last overall for the first time in history, and didn't even get the first overall draft pick from it. Buffalo had traded that choice to Minnesota for Cosmo. It probably wasn't the worst season in Bandits' history; that distinction might belong to the 1999 team (4-8). But considering the finish, it might have been the most disappointing year. Be notified of new posts via Twitter @WDX2BB.